Today I want to talk to you about an adventure that I wouldn’t have been able to live if I didn’t have a blog. 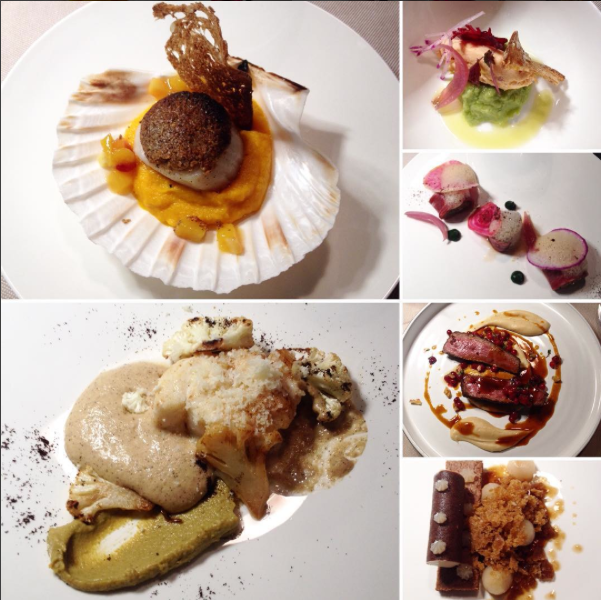 If you follow Coolbrandz or Nespresso on social medias, you might have heard of the Nespresso Gourmet Weeks. The menus are then sold to the public for a more reasonable price than usual gastronomic menus (between 70 and 120 CHF) It’s a win-win really as the chefs can become more famous and Nespresso too. The idea of having fish with coffee is a bit scary at first but trust me, it was delicious ! Anyhow, I was invited by Coolbrandz to one of the restaurant participating in the Nespresso Gourmet Week and I was delighted ! Don’t be afraid, I’m not talking about this restaurant because somebody paid for my dinner, I’m sharing this experience with you because I genuinely liked what I ate, and so did the friend who came with me. The building contains a library, an art gallery and a restaurant. The restaurant in itself is divided into two parts, a dining area and a tapas bar where you can listen to live music every now and again. But let’s get back to what’s really interesting here, food ! It made me laugh a little to see our plates after reading this sentence, because I don’t find the “no fuss” part really fitting when it comes to how the plates are presented. Indeed, there’s nothing simple about the presentation, it’s really more artistic ! Don’t think that’s a bad thing but know that I won’t be fooled, it’s not enough to present things nicely. They have to taste good and if they’re beautifully presented, well that’s an added bonus ! However, when it comes to taste, I couldn’t agree more with his motto ! What I really like about this chef’s style is that he doesn’t feel the need to hide the original taste of the ingredients behind tons of other flavours like it seems to be the trend at the moment. But that doesn’t mean that you won’t get a ton of flavour in your plate, it’s just that they’re thought in such a way that allows each person to eat things the way they prefer. If you like your monkfish pure and without any sauce, that won’t be a problem, because the sauce is on the side. On the other hand, if you like it covered in coffee espuma, that’s possible too. What else (hehe) would you need ?! During our meal, we tried the whole menu that had been made for the Nespresso Gourmet Weeks (1 amuse-bouche, 2 starters, 2 main courses, 1 desert) and if the starter with beef was too bitter for my taste, I liked all the other courses. The quality of each ingredient was exceptional and that’s also what allows a chef not to hide the products in sauce (which you kind of have to do if your fish is already a bit old…) The quality was particularly obvious when it came to the monkfish and the scallops that were extremely tender. As for the venison, it just melt on our tongues. Each course was really well balanced in terms of flavours and textures as well as colours. I also managed to speak with Serge Labrosse for a few minutes and he talked to me about the challenge he had faced. How do you incorporate coffee into 6 consecutive courses without it being overpowering or the client being completely fed up with the taste. When we were done, Mélody was ready for a second desert and I would have gladly had another scallop. Not that we were still hungry but it was that good ! If you are in the Versoix area, I strongly suggest to pop into the Boléro restaurant. It’s very unlikely that you’ll be disappointed. Be it the fish, the meat, the vegetables or the desert, everything was mastered. And someone who manages to make scallops and coffee go together should be able to make a farandole of other nice dishes. Finally, and that’s very important too, I want to stress that the service was also extremely nice. Everybody in the team was very pleasant. I want to thank Eileen once more for this amazing adventure ! Had you thought of mixing scallops and coffee ?